The first Windows 10 laptops with Amazon’s Alexa voice assistant embedded in the operating system – debuted at CES 2018 – are apparently just the beginning. By the end of the first quarter of this year, laptops (and PCs) from Acer, Asus, Lenovo, and HP will include the feature. This will be made possible by an Alexa app for Windows 10 that will be available for download in the near future, with those four aforementioned vendors being the first to receive it. The first Acer laptops to feature the Alexa app (announced during CES) are the Acer Aspire 5, Aspire 7, Spin 3, Spin 5, Switch 7 Black Edition, Swift 3, Swift 5, Swift 7, Aspire Z24, Aspire U27 and Aspire S24. So, quite a few! Asus, on the other hand, has yet to explicitly state which of its laptops are going to feature the app, but said during CES that select ZenBook and VivoBook models will include it. Today, Amazon revealed that the ZenBook UX331 – otherwise known as the 2018 edition ZenBook 13 – will offer Alexa upon release. So, what will Alexa on Windows 10 laptops look like? The digital assistant will appear on the OS through an app that displays information in a similar way to how it appears on Amazon Echo Show and Echo Spot, and of course it will be accessible via voice control. Alexa will be able to check your calendar for upcoming events, create to-do lists for you, answer general questions, read off the day’s news and set timers among other tasks. Naturally, it will also play music for you through supported services as well as audio books – and it will be able to control your smart home devices. What the Alexa app on Windows 10 won’t be able to do is hold voice or video calls or send text messages – that’s reserved for the Echo family of Amazon devices. Also, sadly for our readers in the UK and Australia, the Alexa app on Windows 10 will launch only in the US to start, with no word on when it will land in those regions. 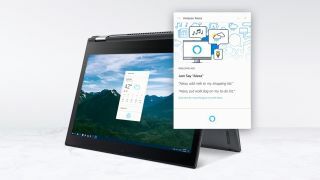 It will be interesting to see how Alexa and Cortana get along on the same OS, especially considering the latter is far more deeply embedded into Windows 10. Even more interesting will be seeing which of the two gains more adoption, with the latter arguably being way more ingrained in people's’ lives through the sheer amount of Echo speakers in their homes, compared to Cortana. Until then, we wait with bated breath for the first Alexa-equipped Windows 10 laptop to grace the TechRadar offices - let's hope it's not too long.